I dry my extra figs and can enjoy the dried figs throughout the year, I made a simple plywood box, large enough for the wire rack I had in the kitchen. I cut the figs in half, place on the rack, put the rack in the box, cover the box with some screen and leave it in the sun. I take the figs inside at night and put them back in the sun in the morning. takes about 6 days. Hi Tori, me again with a wonderful fig recipe without a recipe ! ( please never margarine)and when they begin to brown pour some wine, sugar or honey to taste, any kind of wine could be brandy, whisky or to your likes and let them get in fire and burn until the Alcohol disappears, let them cook for a while and serve them with a roast beef or duck, also with vanilla ice cream . you can also use them to make stuffed meat with same figs, just a little imagination and they get to be delicious! I buy a raw bread crust and I put inside a whole Brie and the same figs chopped, cover it with the same crust and put some egg wash and to the oven until brown and serve it warm. Thank you SO MUCH for sharing your amazing talents with food. I have recently discovered your site and am already enjoying your recipes. I am grateful to you, Tori! P.S. 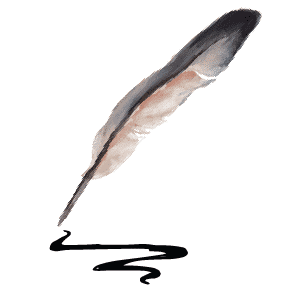 Did you know that your name means “bird” in Japanese?!! Lisa, you just brought back such a nice memory. My grandmother had a friend named Aiko from Japan and she always called me “Little Bird.” Maybe that’s why I like birds so much! There is a great recipe that I have. It is not kosher, but delicious. Stuff the fig with goat cheese and wrap the fig in proscuitto and roast. The outside is crispy and delicious and the inside is gooey and sweet! Pinch them off the bush n bite in. I actually need some good fig rrecipes. We don´t get very good fresh figs in Pennsylvania but I´d like to try some. Can´t beat fresh figs, brie and crosstini on a plate. Grilled figs with bleu cheese and honey!! I just love figs fresh! They are also good with Brie!! Fig Gelato .. with or without nuts. It´s to die for!!! Send me some I like them just the way they are. I have one fig exactly one fig…. I have lost 2 adult fig trees, over the last 44 years, to hard freezes, in Texas. I also had to beat the birds to the figs before they were fully grown. Enjoy yours while you can! one of my favorite fruits! My all time favorite way of fixing figs is to butterfly them and stuff them with a teaspoon of gorgonzola and a walnut, close, wrap in prosciutto and bake until sizzly, about 10-12 minutes at 400 degrees. Beautiful tree and lucky for you, the harvest. If you can put together fig preserves the way they are in France, I´d be delighted. I love them fresh off the tree! I once had a caramelised fig and blue cheese tart and omg soooooo delish! I make a great fig and balsamic sauce. 2 cuts on the bottom crosslike but not till the top, fill with blue cheese (or any other you like) and roast them on a hot pan. Oh my gosh, I haven´t seen one of these since I was a kid. We had one in our backyard. Do you have a dehydrator? Use them in winter cooking. OH THE MEMORIES! My grandfather actually grew in very large fruit bearing fig tree in his MICHIGAN greenhouse (unheard of!) 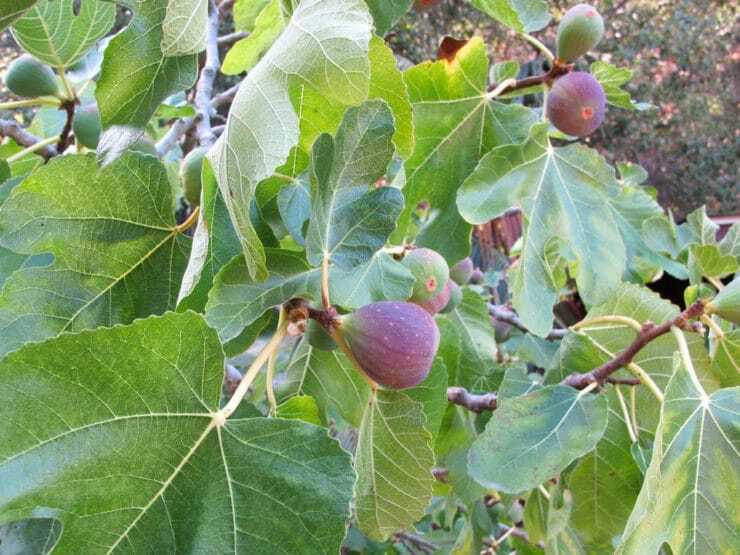 so I grew up eating figs…the land was eventually sold and the greenhouse fig tree an all were demolished by the new buyer. I will never again take this lovely fruit for granted (in the Midwest it comes along infrequently and can be pricey) CHERISH each savory bite…and ENJOY. A gluten free fig cookie of some kind, please! I just want to see some fresh figs somewhere around here!! Figs have been one of my favorite foods since I was very young. I simply ADORE them. Fresh, dried, pickled, brandied, even “Newtons”. The only thing I haven´t tried is the…well…”clothing” options! I have two small fig trees that I bought earlier this Spring. I will keep them in pots in my library during Winter but leave them outside all Summer. Do you do anything to them? I love fresh figs! Hi, Goat cheese & figs! had a rustic fig bread(reminded me of Italian_ in Califoronia. Don’t love figs but loved this bread. Your recipes are divine so whatever you post, we will love and appreciate. My Mom loves them wish I had a fig tree Your lucky! 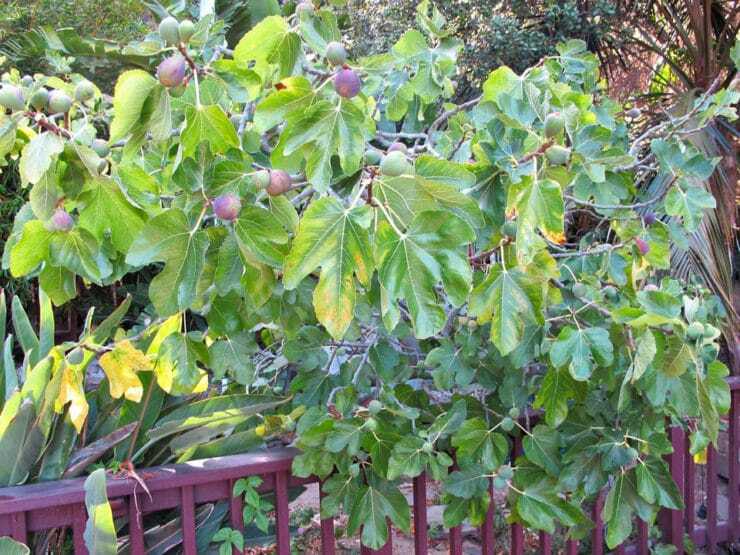 Had a fig tree when I was growing up in No. Hollywood, CA. Wish I had one now. How about mini fig tarts or Honey- and Goat Cheese-Filled Fig Muffins? reminds me of when i was young my grandfather had a fig tree and I used to pick the figs off the tree and eat them. those were the days! Dear Shiksa, I´m fond of fig spreads with a side of goat cheese. Best to make preserves first and then use them in a recipe, since they won´t all last long. You can amass a lot in the fridge and then commit to making preserves. I like some fresh figs on a plate with a nice, mild to sharp cheese and some crackers. Can do for breakfast, snack or lunch. sliced with goat cheese (the kind in the log works well; not feta) drizzled with honey and maybe a sprig of rosemary or thyme…the best dessert in the world. Grandma used to make fig preserves – yum! Did fresh figs cut in half with dried ricotta cheese wrapped in Italian dried ham and drizzled with fig balsamic vinegar so yummy everyone enjed them! you are so lucky!! Figs don´t grow in New York that I ever see. Oh Fig jam is my all time favorite!!! Tori have you ever had fig beef jerky? It is fabulous!